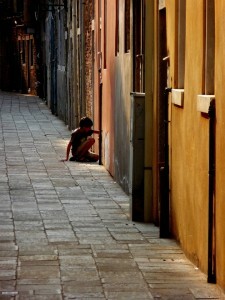 Discover Venice: this blog is dedicated to Venice, its history, its wonders and the love I have for this amazing city. But I have many friends who share this passion for the Serene Republic and through writing and photography they try to inspire other people to love this city and look beyond the crowds, the cheap souvenirs and the stereotypes. This post was written by a very old friend of mine Katia Salviato, owner of the blog Justcomforfood – I have known her since she used to go kinder-garden with my little sister, that makes it more than 35 years! But it has been only recently that we realized we shared a very strong passion for Venice, food, photography (she loves to take photos, I love to admire them) and writing. So these are her suggestions on how to visit Venice. Not what, not when, not where, but simply how to visit the city and how to get the most of it! 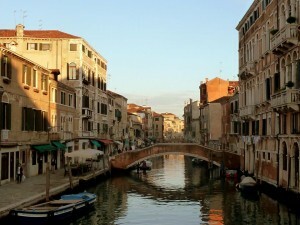 Venice is the city in the world whose image is, probably, the most overused and stereotyped. 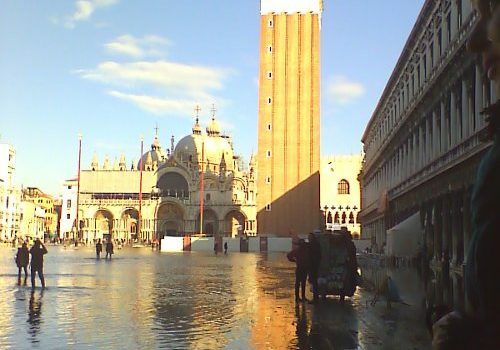 Saint Mark’s Square with the high water. A giant cauldron where it all ends for the use and consumption of hit and run tourists, of travel agencies, of low cost manufacturing of disputable quality. For this reason, unless you’re a first time visitor, let me give you some advice on the best way to visit Venice going beyond the obligatory itineraries and overcrowded circuits. Above all, what I would suggest is to spare a bit of time, because a day, or two, spent hurriedly through the narrow streets, is like a war path, and certainly not the best way to understand the city. Which is small, but full of history and atmosphere. Venice is an old lady, and as such it demands whispers and graceful movements. Not the Cavalleria Rusticana (Rustic Chivalry). Therefore, assuming that you are among those people arriving in the city for three or four days, without the eagerness to do everything, but only with the desire to get lost in a sea of sensations, I will try to explain how your senses will be able to capture Venice. One at a time. Venice is noise. 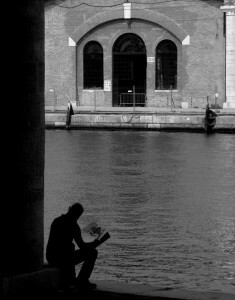 Venice is silence. It is the lapping of the water splashed by the oars of the boatmen, the noise of the vaporetti and the tope, the sirens of emergency vehicles whizzing in the canals. Venice is the cacophonous voices of the Rialto market, the astonished cries of those who marvel, at every step. The cries of the gulls. It’s that ciao, more! (hello darling) repeated like a mantra by those crossing each other and stopping for due chiacchiere (two chats – two so to speak, because the perception of time, in a city without cars, is only relative). Venice, however, is also the almost claustrophobic quiet of the most isolated corners, which are many: coming out of the fixed routes, those indicated by the signs RIALTO – SAN MARCO, you enter almost in another dimension, free from noise and crowds: it is the not so exhibitionist Venice, the less blatant, but no for this less beautiful city. In this coy Venice, it will only be you, you and the trampling of your quiet footsteps, marking the passage of time like a lazy metronome following an English waltz tempo. There is a term that on its own says it all about the typical smell of Venice and it is: freschin. Untranslatable word but only maybe by a long periphrasis, containing a precise and vaguely unpleasant imaginary: freschin is the smell of badly dried clothes, a wet dog odour, that scent of egg or fish that sticks to dishes. Freschin is inextricably linked to Venice, a humid and stuffy city, sometimes refractory, especially in the past, in respecting the most elementary rules of hygiene: in fact, for those of you who are tempted, when there is Acqua Alta (high water), to bathe in St. Mark’s square immortalizing yourself in funny pictures like these tourists here, well, you must know that your bodies will be immersed in a sea of sewage. At your own risk! Venice, more generally, smells musty and old: it smells like grandparents, of old moth-eaten cabinets, full of mothballs. Which is in anyway preferable to the new smells, that of Lush, or McDonald’s, for example, that little have to do with the real city. It’s the smell of fruit from the outdoor banquets, of the sunscreen lotions and ice cream, of sticky sweat and fried fish, of sea salt and garbage hanging in the sun. 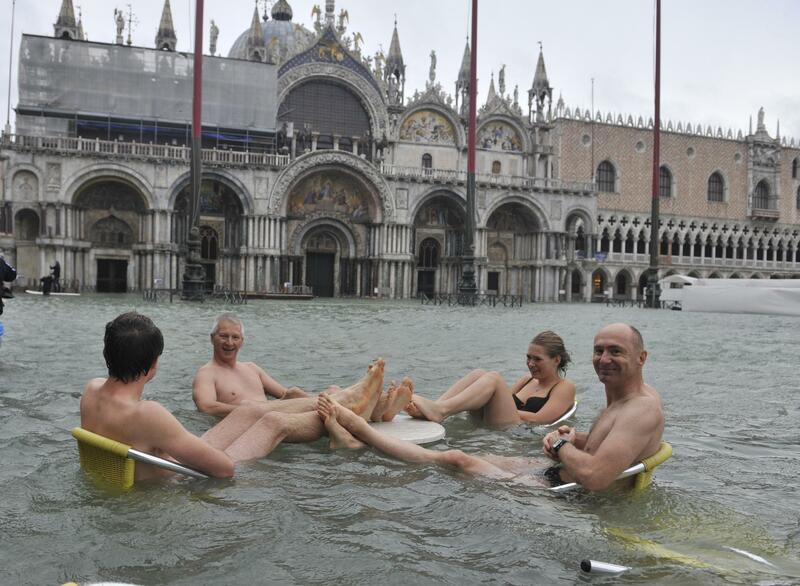 Venice will be very intense for your nostrils, not always in a pleasant way, but so exciting. Venice is dazzling, beautiful enough to make you breathless, yet strangely discreet in exhibiting its virtue. There are no strong colors (for those you must go to Burano, the kaleidoscope island): in Venice everything is made in Istrian stone and plaster, now dull from time and wear. Venice can be seen from above, from below, turned around and turned inside out (like a sock) and it will always offer food for thought, from different points of view. Looking down, it is a huge mirror: the canals, or the wet pavement, duplicate images and people, in a wonderful game of references. If you love shooting with a camera, you will find bread for your teeth. And yet, beneath your feet, if you do not know, there is an upside down forest: poles planted in the marshland, to hold up tons of people and buildings. Because the settlers, in the past, sweated real hard for Venice, you bet! Upwards, the town offers a lot of surprises: gardens, jealously hidden by the outer walls of the buildings, ornaments, shrines, flying lions, just like pigeons. A treasure hunt, a continuous discovery, for those who want to devote themselves to it. By the way, if for “looking down” the password is “beware of the step,” for “looking up” it will be “mind the pigeon”: it seems that their favorite pastime is playing shooting with those tourists who do not have a change of clothes at hand. 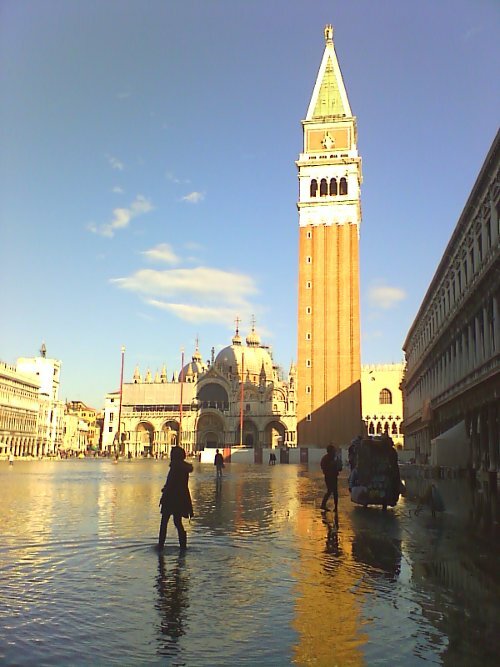 Venice is as smooth as the stone of which it is made of; indeed, rather than smooth, slippery, especially on damp days, which means 80% of the time. And sticky, for the same reason: of sweat, of ice-cream poured on the paving stones, of chewing gum stuck above your head, on the arches of the bridges. The city is cold and icy in winter, with the moisture that gets into your bones and makes you cringe, and hot in summer, when the breath is shortened and walking gets heavy, and the vision of another picturesque corner makes you think of a mirage in the desert, rather than reality. But remember, when you are about to plan a trip to Venice, to prepare adequately from the physical point of view; you will think boldly: “right, it can’t be that bad to walk in such a small town! There are only four large bridges. I can do the others with my eyes closed. But Venice is treacherous: it is true that the most difficult bridges are few, but the others, ringed one after another, dozens of them, can really nail the quadriceps. Look out. And always remember that wherever you go, you will always have to come back! 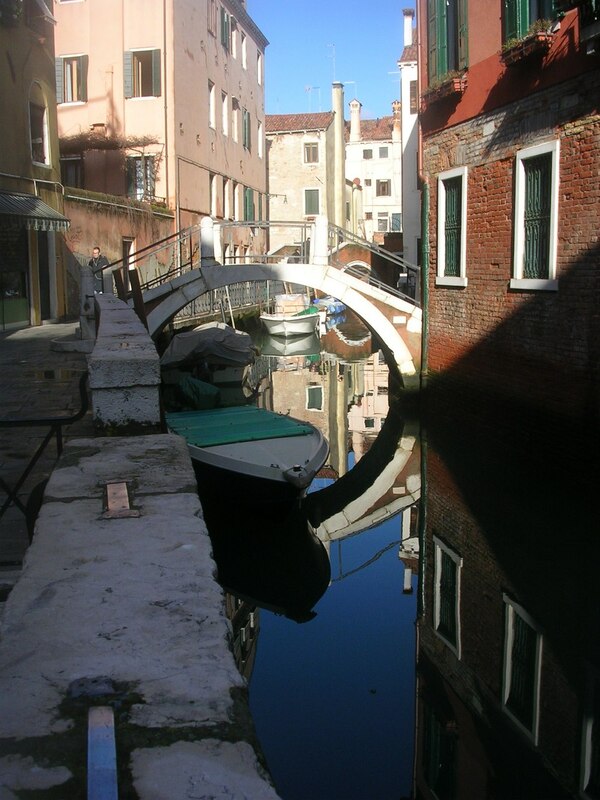 If you are in town and do not want to spend crazy amounts of money, and you want to feel “Venetian” or almost, the word for you is: cicheti. For lunch or dinner, enter into a bacaro (a typical tavern, with informal wood paneling and a few seats – a little local fast food): on display on the counter, you will see exposed plates with croûtons with baccalà, sweet and sour sardines, meat or fish-balls, sandwiches (completely different from the other sandwiches that are around in Italy), small panini with cold meats or cheese. Build your own small plate, all accompanied with a ombra of white wine, and relax, enjoying the full flavors of the food that is being offered. If you have more time, maybe in the evening, then find a tavern, a restaurant, a little place to dine quietly. If you can find the right place (and there are many of those, you just have to avoid the tourist traps), it will be very easy, and recommended, to choose a fish menu, which here is great . 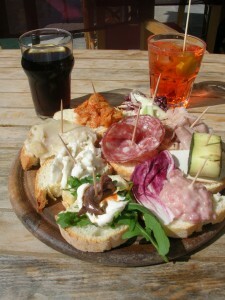 The first courses are the best, as far as I’m concerned, but everybody knows that Italians prefer carbohydrates. However, a good risotto with cuttlefish ink or a portion of tagliolini with prawns, to give you two examples, will make you feel the flavor of the sea and the lagoon. Oh, one more thing: the bread made in Venice is the best in the world. I do not know why, but I have never eaten anywhere else such a good bread. In short, this is the way I personally feel and live the city. My last, very last advice before I leave you, is when you are in Venice, after visiting the main sites, keep a day aside for getting lost. Wander about, in the less crowded narrower streets, in no hurry. It is the only way. a very international greeting which, if you do not know, was born in Venice: from a contraction of the word sciavo (tuo) (your slave), the servus in Latin.